Matthew O. Giddens, youngest son of Isbin Giddens, was born 1844 in that part of Lowndes County, GA later cut into Berrien County. When Matthew was about nine years old his father died, on October 21, 1853. Isbin Giddens was buried at Union Church Cemetery, in present day Lanier County, GA. Matthew’s older brothers, William, Moses, and Aaron served as executors of his father’s estate. Two years later in 1855 Matthew’s mother, Kizziah Knight Giddens married the widower Allen Cone Jones. Matthew and his minor siblings were taken into their step-father’s household. 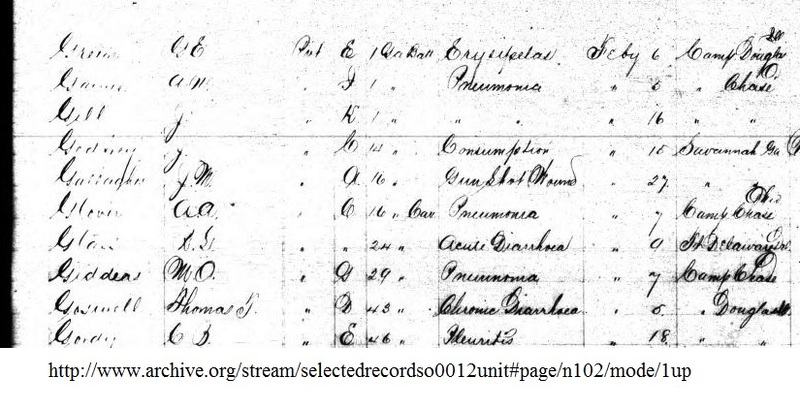 Matthew, his brother Isbin T., and sister Mary all appear in the Jones household in the census of 1860. Matthew’s mother died in November 1861 and she was buried at Union Church, Lanier County GA.
Matthew and his brother Isbin T. Giddens served in the Civil War. On August 1, 1861 they went to Milltown (nka Lakeland), GA where they joined the Berrien Minute Men, Company G, 29th Georgia Infantry, a unit formed by their uncle General Levi J. Knight. Neither brother would survive the war. Matthew O. Giddens was taken prisoner on December 16, 1864 near Nashville, TN. He was imprisoned at Camp Chase, Ohio where three months later, on Feb 8, 1865, he died of pneumonia. Isbin T. Giddens, died of brain fever at Guyton Hospital in Georgia. Camp Chase, OH ca. 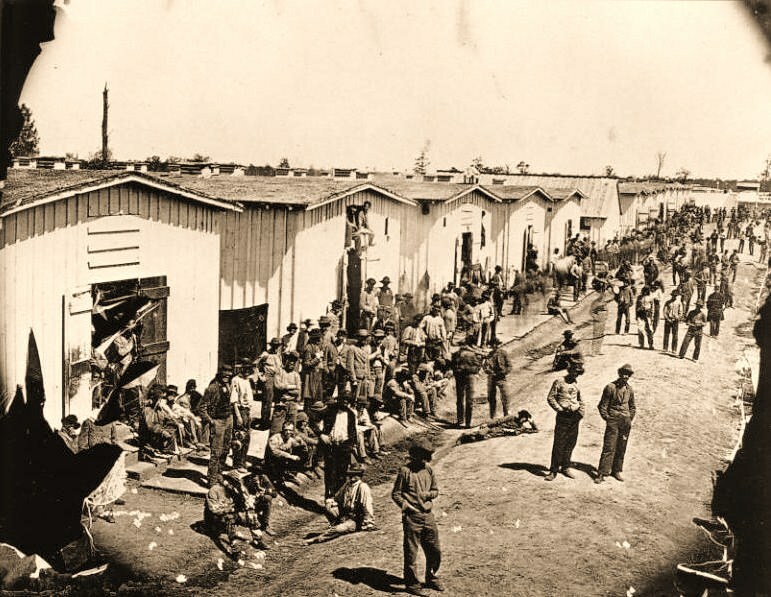 1861-1865, federal prison camp for confederate soldiers. Photographer, Manfred M. Griswold. The conditions at Camp Chase were deplorable, some say nearly as bad as the prison operated by the Confederates at Andersonville, GA.
Gravemarker of M.O. Giddens, 29th GA Regiment, one of 2260 confederate graves at Camp Chase Cemetery. I am looking to find who I have to get permission to use the Camp Chase, OH Manfred M. Griswold photograph you have above. It will be in a book that will raise money for a non-profit to try and save buildings at the old Soldiers Home in Dayton. It will be used to tell of how the buildings from Camp Chase were used to build the first barricks at the Soldiers Home.